As the NFL season winds down, there’s no question that there is a new breed of fashionable men in town. No one missed the runway walk of quarterback Cam Newton, or the burgundy leather suit that Antonio Brown wore off the plane. The NBA is still snagging most of the spotlight, but this league is quickly boasting its own crop of trendsetters. Players are showcasing their off-field style, dressed up in sleek suits for pre-game arrivals and trips to the post-game podium. Not only are they also becoming entertainers to watch, they are also snagging covers and advertising campaigns along the way. Some of my favorite looks of this past season are below, and I cannot wait to see what everyone is wearing at Super Bowl tomorrow in Minneapolis. Think lots of cool outerwear! Last Minute Gift Guide for the Sports Lover! We are in the final countdown to Christmas, and the NFL is quickly approaching the playoffs and the NBA is already almost to All-Star. That being said, you can still order some fun and unique gifts for your favorite sports lover this week for Christmas. 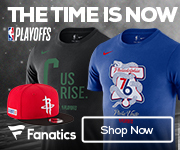 Both the NBA and NFL team stores are having major sales, and ordering on Amazon could never be more simple! Check out my favorite last minute gift guide now! Happy Holiday’s! ALSO, if you are looking for something super special, tickets to any game are sure to please everyone out there! What do you get for the sports lover out there? Whether it is a male or a female, I have listed some of my favorite sports gifts that will cover anyone on your list. From the fashionista to the tailgating king, there is something here for everyone. One of my favorite things is supporting up and coming lines. Rastaclat x NBALAB is celebrating the virtues of pride, righteousness, integrity, discovery, and excellence. Rastaclat honors the legacy of professional basketball with the launch of the Rastaclat X NBALAB COLLECTION. The NBA Lab is a research and development incubator aimed at innovative design, imaginative concepts and strategic partnerships. Both The Very Warm and Rastclat are able to partner with the NBA because of this amazing concept. Black and Yellow with some NFL Fan Style! The NFL is already in week five, can you believe it? The Steelers are 3-1 going into tomorrow’s game against the Jaguars. This weekend I am doing a fun homegating party, and having everyone wear their favorite team gear. For me, it is all about working it into some fun and trendy sportswear pieces. This t-shirt is from 47brand, one of my favorite lines for sports gear. I am totally into all kinds of ripped jeans this season, and I finally took the time to try on a pair from Khloe Kardashian’s line Good American available at Nordstrom. They are so comfortable, and are the perfect pair because not only are they super on trend, I can jump up and down and cheer in them. So many fun lines are making a comeback, and this jacket from Kappa is super cool and retro. I love that it can double up with my leather pants and boots this fall. Stay tuned for more fun throwback lines coming your way! Of course, I have some new kicks that have just arrived to my door, and the colorway is light and easy. This adidas NMD XR1 kick has a sock-like primeknit making it feel like you are walking and running on air. They are perfect for a basic day, as well as a full long run. I have been on the hunt for a fun new line of stadium approved bags, and this line from Sheer Gear is one of the cutest I have seen so far. Their bags are all super trendy, and my favorite part is the cute Steeler color pomp poms that are on the side of the bag. I mean how cute is that? I feel like I can totally keep my sense of style with their bags! CHEERS to week 5 of NFL football kids!!! !